This spacey psychedelic album is notable for the involvement of Steve Hillage. Musically it's at times a little over the top. But, the opening cut, Garden Of Earthly Delights is of interest and Azathoth has a rich 'church' organ backing. On side two Clean Innocent Fun previews Hillage's fine guitar work and Metempsychosis opens full of weirdness and sound effects (which recur at regular intervals throughout) before pursuing a similar vein. The latter track, in particular, begs comparison with Pink Floyd around the Saucerful Of Secrets era. 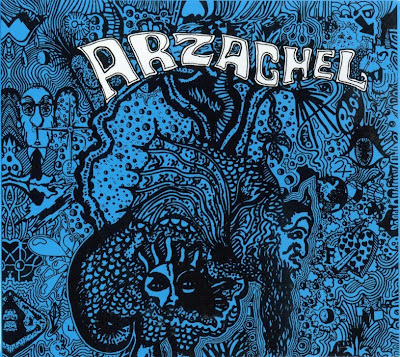 Arzachel is a very keyboard-dominated album. I have to admit I have only owned a copy of this classic album for a couple of years, and this review consists of information lifted directly from the CD notes plus my impressions from repeated listening. Before its reissue by Dropout records this album had been fiendishly hard to find and collectors would pay ridiculous sums of money to secure a copy. It’s not hard to see why, for several reasons: it was recorded early in the careers of Dave Stewart and Steve Hillage, who both went on to become giants of the British progressive and psychedelic scenes. What’s more, it has all the trappings of an underground classic: recorded and mixed in an afternoon, cover art done by Dave Stewart with a felt-tip pen, sleeve notes consisting of fake biographies of the band under assumed names (the reason for this was that Stewart, Campbell and Brooks were already under contract to Decca), and released in tiny quantities, later to become available on bootleg. Finally, It is a somewhat eclectic album, the opening tracks securely in the Caravan/Soft Machine mould of organ-led, lyrical progressive pop, moving on through Cream/Led Zeppelin inspired blues, ending up with a protracted psychedelic excursion on the final track. Floydian strangeness, and then it’s back to the beat. Campbell does a bass solo, and we’re back to extended freakiness again as the track careers on to a climax, staying on that one chord the whole time. There’s precious little surviving material from the golden days of British psychedelia, and it’s usually pretty hard to sniff out. We’re lucky to have this shining example (reasonably) freely available again. Great, great, GREAT piece of Music. I rate it 11/10 !! !